This false-color image from NASA's Spitzer Space Telescope shows a dying star (center) surrounded by a cloud of glowing gas and dust. "Spitzer's infrared vision has revealed what could not be seen before - a massive ring of material that was expelled from the dying star," said Dr. Joseph Hora, a Spitzer scientist at the Harvard-Smithsonian Center for Astrophysics, Cambridge, Mass. "The composition of the ring and how it formed are mysteries we hope to address with further Spitzer studies." 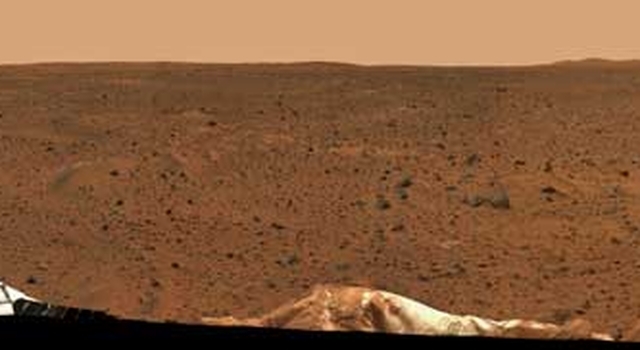 The new picture is available online at http://photojournal.jpl.nasa.gov/catalog/PIA06755. The dying star is part of a "planetary nebula" called NGC 246. When a star like our own Sun begins to run out of fuel, its core shrinks and heats up, boiling off the star's outer layers. Leftover material shoots outward, expanding in shells around the star. This ejected material is then bombarded with ultraviolet light from the central star's fiery surface, producing huge, glowing clouds - planetary nebulas - that look like giant jellyfish in space. These cosmic beauties last a relatively brief time, about a few thousand years, in the approximately 10-billion-year lifetime of a star. The name "planetary nebula" came from early astronomers who thought the rounded clouds looked like planets. NGC 246 is located 1,800 light-years away in the Cetus constellation of our galaxy. Previous observations of this object by visible-light telescopes showed a glistening orb of gas and dust surrounding a central, compact star. 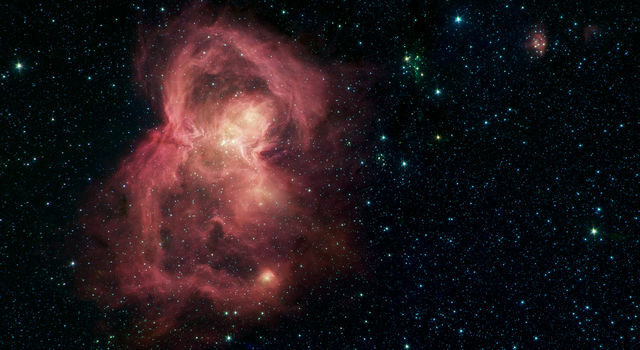 By cutting through the envelope of dust with its infrared eyes, Spitzer provides a more transparent view through and behind the nebula. 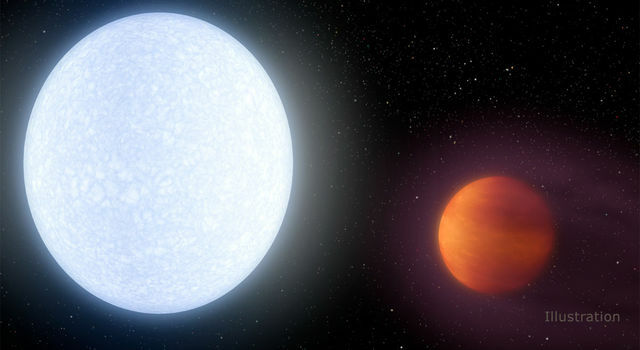 "What we have seen with Spitzer is totally unexpected," said Hora. "Although previous observations showed the nebula had a patchy appearance, Spitzer has revealed a ring component of this dying star, possibly consisting of hydrogen molecules." 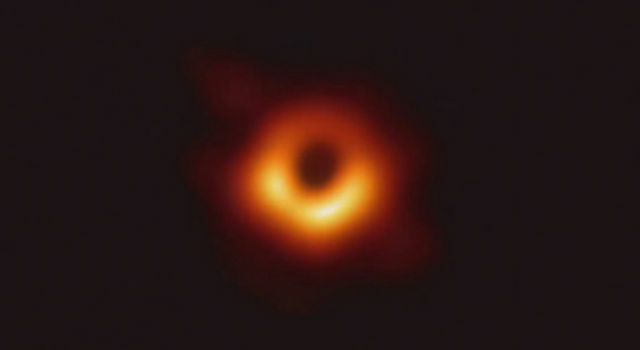 In the new false-color picture, the ring appears clumpy and red and off-center from the central star, while fluorescent, or ionized, gases are green. The central star is the left white spot in the middle of the cloud. Ultimately, these data will help astronomers better understand how planetary nebulas take shape, and how they nourish new generations of stars. A scientific paper on this and other planetary nebulas observed by Spitzer will be published on Sept. 1 in The Astrophysical Journal Supplement, along with 75 other papers reporting Spitzer early mission results. Launched August 25, 2003, the Spitzer Space Telescope is the fourth of NASA's Great Observatories, a program that also includes the Hubble Space Telescope, the Chandra X-ray Observatory and the Compton Gamma Ray Observatory. Spitzer is also part of NASA's Origins Program, which seeks to answer the questions: Where did we come from? Are we alone? The Jet Propulsion Laboratory, Pasadena, Calif., manages the Spitzer Space Telescope mission for NASA's Science Mission Directorate, Washington, D.C. Science operations are conducted at the Spitzer Science Center at the California Institute of Technology in Pasadena. JPL is a division of Caltech. 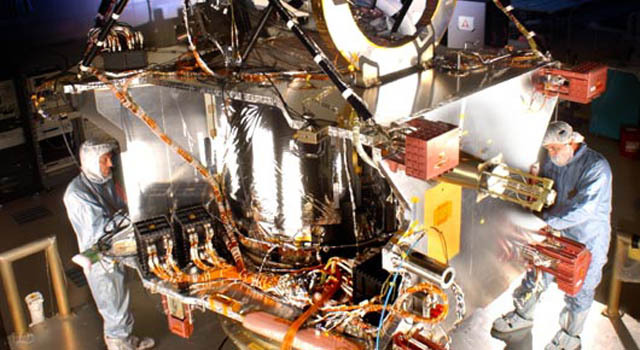 Spitzer's infrared array camera, which took the new picture of NGC 246, was built by NASA Goddard Space Flight Center, Greenbelt, Md. The camera's development was led by Dr. Giovanni Fazio of Harvard-Smithsonian Center for Astrophysics.